This memo was presented at a workshop organised by the LSE Middle East Centre on 29 June 2018 looking at the comparative politics of sub-state identity in the Middle East. 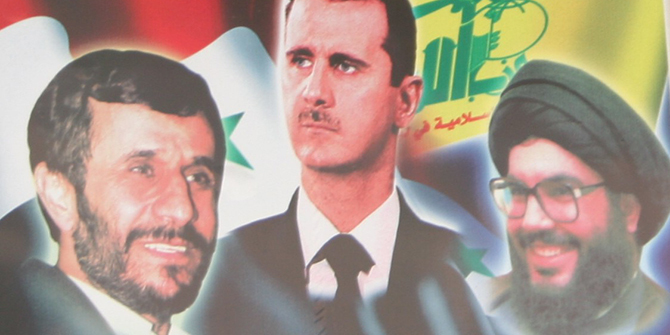 Poster depicting Mahmoud Ahmadinejad, Bashar al-Assad and Hassan Nasrallah in Damascus, 2007. © Sean Long. What is the relation between such dominant identities in the MENA region as nationalism and sectarianism and what are their consequences for the formation of stable states? Within the state, nationalism is often seen as inclusive and good for statehood, while sectarianism is considered divisive and a challenge to it; is the relation therefore a zero-sum one? This depends on the kind of sectarianism. What might be called ‘banal sectarianism’ is non-political, low intensity and compatible with nationalism, since people can easily hold both identities; similarly, ‘instrumental sectarianism’ is a means of group competition for power and resources and can coexists with nationalism; by contrast, ‘militant’ – or high intensity – sectarianism, which claims a monopoly of religious truth and excludes those not holding to it as outside the nation, is inversely related to inclusive nationalism, indeed it ‘sectarianises’ nationalism. The relation between identity and statehood is an outcome of the ‘export’ of the Westphalian states system from the Western ‘core’ to the ‘periphery’, including the Middle East. In this narrative, territorial statehood – borders and bureaucratic apparatuses – were imposed by Western imperialism from without. National self-determination was embraced by indigenous nationalist movements and, after independence, state builders sought to replicate the nation-state form of governance, in which congruence between state (territory under a sovereign government with Weberian features) was congruent with nation (the unit of political community). This was owing to its perceived superiority: it afforded legitimacy inside and enhanced power capacity vis-a-vis the outside. However, in the MENA the outcome was a very flawed states system deviating from the Westphalian model, owing to first, the historic greater power of sub- and supra-state identities over ‘statehood’ (dawla), and second, the imperial powers’ arbitrary boundary drawing, often against indigenous wishes, which resulted in ‘artificial’ statehood, i.e. incongruence between state territory and felt nation, with consequent legitimacy deficits. This required state builders to instrumentalise sub- and supra-state identities – reflected in the ‘neo-patrimonial’ state building practices typical in the MENA region: hybrids of patrimonial and bureaucratic authority that utilised both sectarian and national identities (more below). Yet there are considerable variations among MENA states in their identity balance between nationalism and sectarianism (in its varying intensities), with important consequences for statehood. Explaining the identity balance requires examining several factors. 1- Historical heritage, which includes a) the existing ingredients of national identities, including shared language and attachments to territory; memories of statehood and b) the distribution of sectarian groups, with many small minorities and a large majority facilitating assimilation into common nationalism while 2–3 large balanced groups encourages sectarian polarisation. 2- Modernisation: This heritage is affected by modernisation, including social mobilisation and the rise of class cleavages from capitalist development. While these processes broaden identity, whether it attaches to the state or to sects varies: class cleavages may displace sectarian differences or cross-cut and dilute them but they could also reinforce them, if e.g. one sect comes to overlap with the economic upper class and another with lower strata. Generally speaking, most vulnerable to sectarianism are multi-sectarian societies framed by an ‘artificial’ state (arbitrary borders, without long prior historical precedent), wherein identification with the state is contested by sub- and trans/supra-state identities; with a polarising distribution of sectarian groups and where modernisation does not generate strong class identities. Conversely, nation-state congruence is best achieved when there is a shared language and memories of statehood; many small minorities likely to seek integration into the larger dominant identity, and banal sectarianism cross-cut by class cleavages. 3- Power building strategies: The power building strategies of political entrepreneurs matter – both ruling elites and opposition movements, specifically, whether they instrumentalise inclusive identities such as nationalism or exclusive ones such as sectarianism to mobilise support and whether ruling elites design inclusive institutions or not. State builders have strong incentives (legitimacy, power advantages) to promote a national identity congruent with their territorial states and they have instruments to do so (media, education etc); yet, in short term power struggles, they may mobilise their own ‘ready-made’ group identities – i.e., their sect in multi-sectarian societies – behind their rule and exploit identity divisions within society to obstruct broad opposition mobilisation against them (divide and rule). The former strategies reproduce nationalism and while the latter politicise and turn banal sectarianism into ‘instrumental sectarianism’. In the MENA, state builders widely seek to exploit both sectarianism and nationalism. 4- State institutional design is the final factor that affects a society’s identity balance, with stronger more inclusive institutions fostering more inclusive identities (nationalism); conversely, non-inclusive and weak institutions foster more particularistic sectarian identities. The hybrid neo-patrimonial institutions typical of MENA governance vary in their strength and inclusiveness. Their patrimonial aspect is manifest in the use of sectarian ties to create a loyal core of supporters behind the ruler, thereby reproducing sectarian consciousness. On the other hand, the bureaucratic side of regimes enhances both state capacity (to deliver public goods) and inclusion, via institutions, which tends to reproduce nationalism. Thus the balance of patrimonial – bureaucratic authority in any given regime shapes the balance of nationalism and sectarianism. The extreme case of institution collapse – state failure – where the loss of monopoly of violence (to sub-state movements) creates security dilemmas – fosters militant sectarianism at the expense of inclusionary versions of nationalism. The identity patterns in a society can be seen as ranged along an inclusionary–exclusionary continuum, with for example civic nationalism (coexisting with banal sectarianism) high in inclusion, while a society polarised by militant sectarianism is highly exclusionary. Arguably more inclusive identities focused on the territorial state enable and foster more inclusive, hence robust, state institutions and vice versa. In the middle cases typical of the MENA region, hybrid versions of state building such as neo-patrimonialism build on and then reproduce mixtures of instrumental sectarianism and nationalism. The stability of states depends on the latter containing the former. Raymond Hinnebusch is Professor of International Relations and Middle East Politics at the University of St Andrews, co-founder of the Institute for the Study of the Middle East, Central Asian and the Caucasus, and Director of the Centre for Syrian Studies.